early half of China’s estimated 21 million Muslims belong to the Hui, a group that is one of China’s 56 officially recognized ethnic minorities. Most Hui live in the country’s northern and western provinces, but others live in cities and communities almost nationwide, and they have traditionally been known as farmers, shopkeepers and craftsmen. Among the Hui are women employed as ahong (imams, or Muslim religious leaders), which means that they are spiritual guides for the women (nu) in their community. Some nu ahong (female religious leaders) serve in mosques that are entirely separate from men’s mosques, but most use rooms that are part of men’s mosques. Some live at the mosque or in an affiliated Muslim school, and some are paid salaries, while a smaller number volunteer. Anthropologist Maria Jaschok estimates there are roughly one-seventh as many women’s prayer halls and mosques as men’s, but varying definitions of “women’s mosque” and the lack of statistical data make greater precision impossible. In addition to presiding over nu si (women’s mosques), a nu ahong’s duties may include ritual guidance at marriages and funerals, preaching, resolving political and social disputes, and offering moral guidance and counseling. But perhaps her most important work is that of educator. In my interviews with the nu ahong, they told me that Islam values women as the first teachers of children, and therefore women must be educated as well as good role models. There are many schools for Hui women and girls, and many of them are attached to mosques, run and financed by the Hui people themselves. The precise role of the nu ahong varies greatly from mosque to mosque, school to school and region to region, depending on the needs of her community. Some help women with literacy; others teach the Qur’an; still others give girls from disadvantaged backgrounds a basic education that enables them to teach themselves or even go on to a university. This aspect of Hui society has been instrumental in keeping Islam alive in China. Today more than ever, education is a girl’s route out of poverty. In the past, the high illiteracy rate among women in China meant that most Muslim females too had to stay at home, as they had no opportunities to receive education or join in a broader social life. But things have changed: Now young people are flocking to learn Arabic, partly for religious reasons, but also partly in hopes of landing a job as a private-sector translator, scholar or ahong. Although the newest positions as translators or interpreters in the blossoming Mideast–China trade can earn salaries of 3000 to 10,000 yuan (about $400 to $1400), the position of ahong is still one that offers a measure of security and high community status. s the photos on these pages richly illustrate, China’s Hui Muslim women inhabit religious communities, homes and social spheres shaped not only by Islam but also by China’s Confucian culture and its Communist secular state. The photographs indicate how they have come up with unique strategies to help themselves flourish in these circumstances. Although in China women’s participation in public prayer is generally rare, women’s more general participation in Hui Muslim religious life is strong. For example, my surveys indicate that during Ramadan, women comprise more than half of the Muslims who fast. Further evidence are the subjects of these photos: the widespread presence of trained women ahong (from the Persian akhund, “teacher”) and the existence of “women’s mosques” (nu si). Though the authority of nu ahong does not extend beyond the sphere of women and children (including young boys), it is nevertheless significant that Muslim women in China have such organized authority, training and separate facilities. 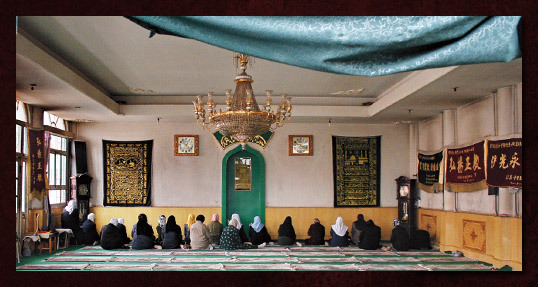 Usually, women’s prayer halls are adjacent to a main mosque, as in Lanzhou in the province of Gansu, or Najiahu near Wuzhong in the province of Ningxia, where many of these photos were taken—communities where I lived in the mid-1980’s and which I have visited regularly since. In many of the mosques in Gansu, women pray in a curtained section or outlying room of the main prayer hall. Less frequently, but not uncommonly, scholars Maria Jaschok and Shui Jingjun have noted, entirely independent women’s mosques exist in northern, central and western China. The existence of a system of extensive women’s Islamic educational training and of active women’s organizations suggests that these practices have long histories in China, though they remain little known both in the country and outside. Because they wear head scarves known as gai tou that cover the hair and sometimes the neck, run shops that sell Islamic goods, participate in public markets and serve in religious and educational roles, Hui women have carved out for themselves a measure of space in the public sphere. For them, a lifestyle that is qing zhen (“pure and true,” equivalent to the Arabic halal) is expressed by maintaining Muslim schools, homes and families, and by marrying within the community. It is rare for a Hui woman to marry a non-Muslim man, though the reverse is not true: It is not unusual for a male Hui to take a non-Muslim wife who is willing to embrace Islam, and to raise their children together as Muslims. In fact, this is one of the main ways Islam has spread in China over the past 1300 years, from its roots among Arab, Persian, Turkish and Mongolian traders. In order to preserve qing zhen, these Hui women, often isolated in Han-majority areas, developed extensive social and marriage networks that connected them with Hui communities throughout northern—even all of—China. This is why trade centers such as Lanzhou, or even local market communities such as Wuzhong, are key places where Hui women network with other Hui communities. This photo essay also tells us something about the social world of the Hui. In some ways theirs is much smaller than the fast-paced society of their majority Han neighbors, in that Hui still interact less beyond the confines of their villages, shops or urban districts, and many still prefer to stay within their smallest communities. At the same time, this essay reveals that China’s Muslim women are also well-connected to the larger Muslim world through trade, travel and even the pilgrimage to Makkah. The Hui women in Lanzhou and Wuzhong interact with other Hui Muslims often from hundreds of kilometers away. These are the networks that preserve, express and create dynamic futures for both the ethnic and the religious dimensions of their multifaceted, complex lives. Anne Miller Darling ([email protected]) is a free-lance photographer with an MA from the University of Bolton, England in international photojournalism and social-documentary and travel photography. From her home in Scotland, she traveled extensively in China during 2007. She now lives in France. Dru C. Gladney is president of the Pacific Basin Institute and professor of anthropology at Pomona College in Claremont, California. He is the author of Dislocating China: Muslims, Minorities, and Other Subaltern Subjects (2004, University of Chicago) and editor of Making Majorities: Composing the Nation in Japan, China, Korea, Malaysia, Fiji, Turkey, and the U.S. (1998, Stanford University). This article appeared on pages 24-33 of the July/August 2008 print edition of Saudi Aramco World. Check the Public Affairs Digital Image Archive for July/August 2008 images.